I finally finished this book! I feel like I've just run a marathon, my mind and emotions feel all rubbery and slack. I'm tired. This novel was a workout for my brain neurons; a serious digestion of word play, some almost too big to swallow, some going down smooth as butter, some felt like I was eating knives. With one hundred pages left, I saw the end in sight, like one sees a lighted tunnel in the distance, but instead of getting closer, I felt stagnant, maybe even farther away than when I started, like some weird psychedelic dream. I was sure I was reading at least 10 pages at a time, but it was really only one or two! I wanted to scream by this point, until – finally - I crossed the threshold and the story progressed, coming to a climax that I expected not at all. I breathed a sigh of relief, reigned my emotions back in, took a Midol and went to bed. Our setting is off the coast of Italy towards the end of WWII, and flight bombardier Yossarian (no one in this story has a first name, that I remember anyway), the hero, I think…is quite inventive in his schemes to never get in a plane again. He's sure someone is trying to kill him, the Germans, every whore in Italy he’s in love with, his comrades, even his commanding officers are out to get him. His problem is the Catch-22. If he’s sane enough to be afraid of dying then he’s really not insane after all. Go figure. Yossarian is the center of the story that everyone seems to revolve around; the one plot point in this isosceles triangle of a novel. Or should I say Bermuda Triangle. I liked it though. Except for that part I got stuck, I liked it a lot. Eventually every point connects to a part that makes sense. I enjoyed Heller’s writing style immensely, but it was a work out. He’s a master of word choice. The way the enlisted men talked to each other reminded me of my grandfather, a WWI vet who served in England. He talked just like these men, this sarcastic dry wit that emanates throughout the book. Perhaps it’s a way people deal with the stress of war. Each character’s personality was perfectly defined and unique, until I recognized their behavioral traits before their names. Some were hysterical. Some were sad. Some were just vaporless filler. I love this book so much! The first time I read it, in school, I didn't really get it and was left feeling blank. I'm not sure what changed my mind and got me to read it a 2nd time, but I've since then read it 4 more and it gets better every time. One of my all time favorites. It's definitely worth reading. The writing style reminded me of the Confederacy of Dunces, another book I liked. Oh yeah, Major Major Major Major - one of many hysterical bylines. There were many sad parts too, wasn't really expecting those. I've heard Mash the movie and tv series were loosely based on this book. There are a lot of similarities. This book stands out to me also. I hadn't heard that the M*A*S*H movie and TV series were loosely based on this before. I loved those shows. That's cool! I need to re-read this sometime to remember and see if I can find the similarities too. By similarities I mean dark satire set in war time, with a sprinkle of lunatics for good measure. Lots of crazy commanders in Mash, one central character in the plot - Hawkeye - surrounded by an oddball cast, stuff like that. Wow, sounds like quite a book. Not one to rush through. I have a copy of it just waiting for the right time. God I had the exact same issues. It took me almost 5 tries to finally get the whole thing done. I was unable to cross the mental barrier for awhile and push through but in the end I was so glad I did. The first 2 chapters alone make it one of the funniest books I've read to date. Rebecca - Suggest it for a book club. It will make you read it and it's a fun one to discuss. P&P - The first two chapters were very funny. And I loved the commander who kept walking out of a room only to immediately walk back in again. And the doctor who whined all the time, thinking he had every illness. Who thinks of that? I laughed and laughed. 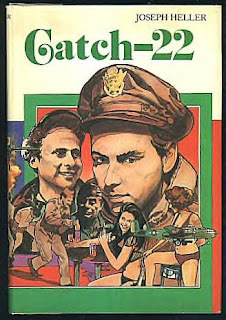 My favorite moment in this book is when Yossarian tells Daneeka, "You scratch my back, I'll scratch yours," and the Daneeka immediately starts scratching Yossarian's back. That was funny. One of many, like the Doctor thinking he had that Ewings Disease? I laughed and laughed.